(Nairobi, October 4, 2018) - The recent arrest of Eritrea’s former finance minister is a troubling sign that repressive tactics continue despite changes in Eritrea’s diplomatic engagements, Human Rights Watch said today. 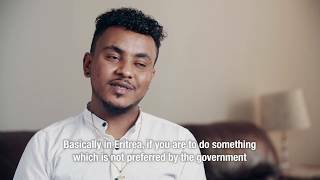 Human Rights Watch released a video about Eritrean political prisoners including 21 senior government officials and journalists detained in 2001 after they criticized President Isaias Afewerki. Eritrean authorities arrested Abrehe Kidane Berhane, the former finance minister, on September 17, 2018, after he criticized President Isaias on YouTube and in a two-volume book, urging an end to Isaias’s “dictatorship” “and transfer [of] power to [a] new generation of young leaders.” Berhane’s YouTube video and book, Eritrea Hagerey [Eritrea, My Country], echo the same concerns.